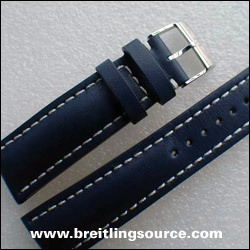 Breitling Leather straps with tang buckles are a great all-round affordable use leather strap for your Breitling watch. Relatively inexpensive to replace when worn, they cost around $100 online, and perhaps $125+ at your local AD. They come in many colors ranging from standard black and brown to blue, green and even pink.